This council event helps keep communities informed on what oil spill prevention and response measures are in place in Prince William Sound, especially those involving their local fishermen. Whittier residents learned about oil spill response technology, tactics and how this program helps Alyeska operate safely in Prince William Sound. Narrators from both the council and Alyeska were on board to help participants understand the training. We would like to thank our partners, Alyeska/SERVS, Stan Stephens Cruises and Whittier Community School, for helping to support this event. During the training, fishing vessels practice deploying oil spill boom and pulling it in a slow formation. If the vessels move too fast, too slow, or get out of proper formation, their efforts to collect oil are not as effective. Since the inception of SERVS after the Exxon Valdez oil spill, the council has been highly supportive of local fishermen and mariners being trained annually with the best available technology to prepare for oil spills. This system helps ensure the most comprehensive response measures are in place for both open water and nearshore resources. A major lesson of the Exxon Valdez spill was that incorporating local mariners into the spill response system helps ensure a quick, efficient and effective response. 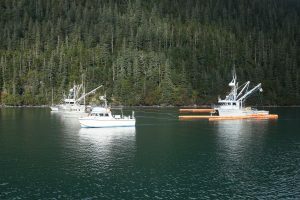 Whittier mariners have the most intimate knowledge of, and connection to, the waters near Whittier. Their involvement would help protect the most sensitive areas, such as hatcheries and spawning streams, from spilled oil. 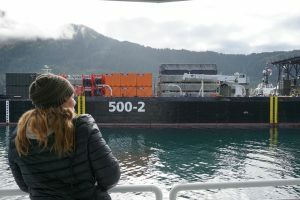 An onlooker gets a close look at the oil spill support barge, the “500-2”. This barges carries response equipment such as skimmers and boom. 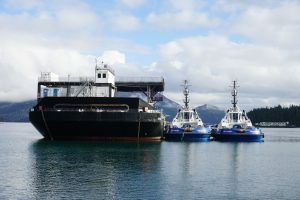 The council has held previous fishing vessel oil spill response training tours in Seward, Cordova and Homer. Future tours are tentatively planned in other Southcentral Alaska communities, including Valdez and Kodiak. The council hopes that through such programs communities will understand the importance of oil spill prevention and having the most robust response strategies in place in the event of a spill.